Retcons are often the lifeblood of comic book storytelling. I mean, who doesn’t appreciate somebody fixing the mistakes of a previous editorial regime by wiping that older story from existence? While I can understand some hang-wringing regarding how some retcons have been deployed in the Spider-Man universe over the years (Norman Osborn sleeps with Gwen Stacy? Yucky… Aunt May’s death is faked by Osborn to mess with Peter? Stupid…), because we’re talking about serialized fiction that’s been coming out at least once a month for the past 50 years, I understand the necessity to go back in time and fix some things in order to then be able to write about new ideas and topics going forward. 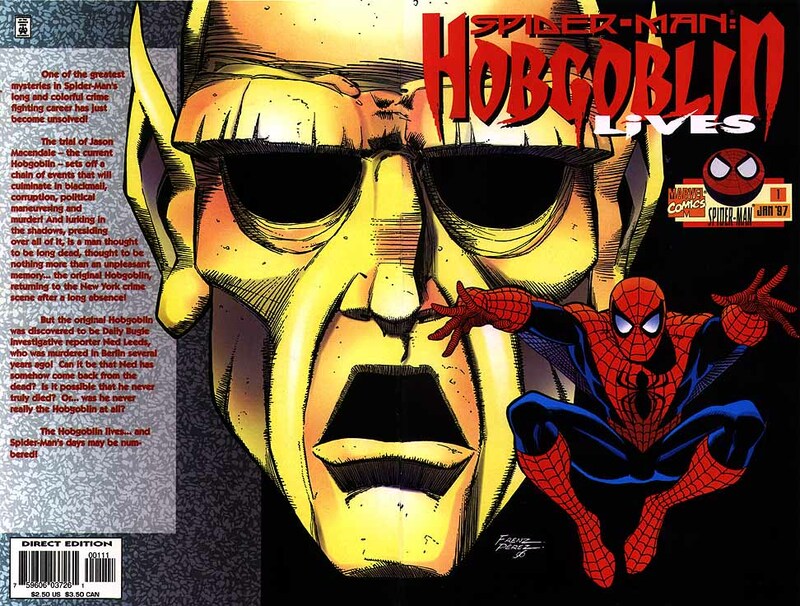 But the “Hobgoblin Lives” mini-series is one of the more unique retcons I’ve ever come across. 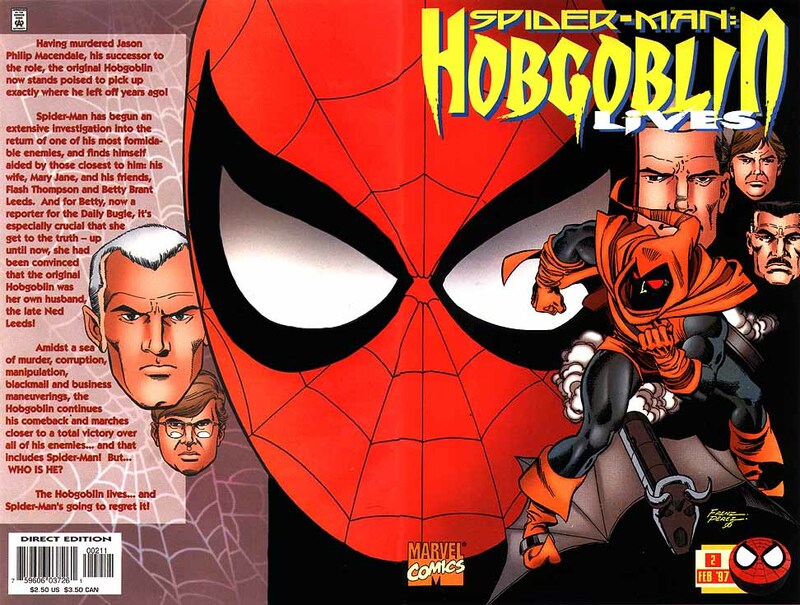 It certainly fixes an admitted storyline mistake that fans were not happy with – Ned Leeds as the Hobgoblin was one of the biggest letdowns in Spider-Man history – but I can’t say with any certainty that the new version of events that writer Roger Stern created for this mini was something the fanbase was clamoring much for either. And before anyone tells me that people probably thought the same thing about Norman Osborn when he was revealed to be the Green Goblin by Stan Lee and John Romita Sr. in Amazing Spider-Man #39, I would counter that at least Norman was established as being part of Peter’s life (through his son Harry) and future creative teams did a stand-up job making him into an interesting character with ambitions and motivations that would justify him being a supervillain. Kingsley is a creepy guy who has his share of enemies, but I’m still not sold on the idea that he would turn to villainy (of course, the same could be said for Ned). This mini was released in 1997, right in the heart of my collection’s “dark” era where the week-to-week excesses of the “Clone Saga,” along with the other 950 Spider-Man centric titles just sucked the fun out of comics for me and caused me to give up cold turkey. When I eventually returned to comics years later, I read nary a word about the Hobgoblin until Dan Slott decided to resurrect Kingsley for his “Big Time” arc, only to kill him (well, not exactly). 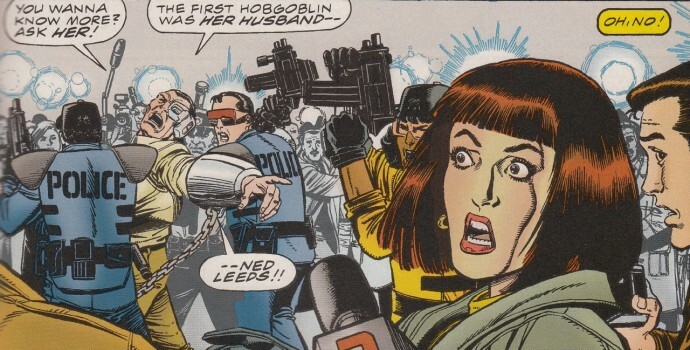 I think it was in that moment where I realized there was a major hole in my Spider-Man knowledge since I had always assumed that Ned was the Hobgoblin. That’s when I learned about “Hobgoblin Lives.” “Drat. Another damned retcon,” I initially thought. Fortunately, because Stern wrote it (and Ron Frenz, who worked on the Tom DeFalco-scripted Hobgoblin Amazing Spider-Man issues after Stern/John Romita Jr., provided the pencils), the mini ends up being a fun three-part story that actually seems more emotionally-invested in clearing Ned’s name, and by proxy, long-time Spider-Man supporting cast member Betty Brant, than actually selling Roderick Kingsley as being someone fans should get excited about. 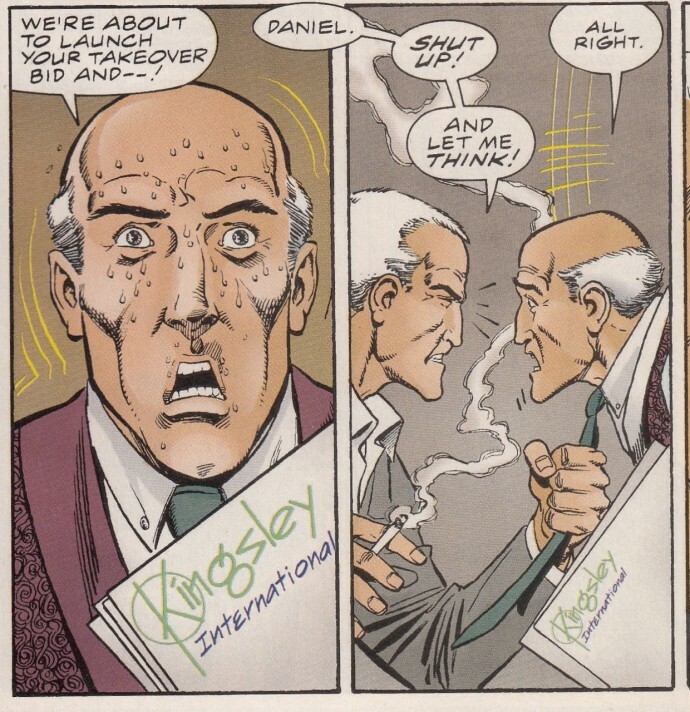 In fact there’s one panel where Peter is going through the list of suspects in his head, and the only name that has any juice to it is J. Jonah Jameson (which would have been a HUGE misstep if he was revealed, mind you) and the only superlative that could be associated with Kingsley was his business background. The impetus behind the entire story is that the second Hobgoblin, Jason Macendale, aka Jack O’Lantern is on trial for his crimes as the Hobgoblin and on the way to prison, taunts Betty by outing Ned as the Hobgoblin. Kingsley witnesses the whole thing, and kills Macendale for drawing attention to the issue. Kingsley then dons the attire of the Hobgoblin again which raises the concept for Spider-Man and his supporting cast that the REAL Hobgoblin might still be out there. 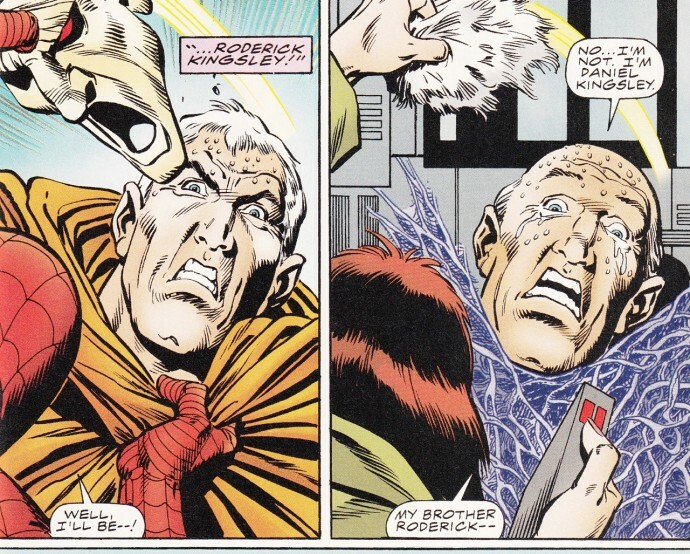 The mini-series finally gives Stern the opportunity to develop the storyline he had planned for the Hobgoblin from the get-go (or at least starting with the ASM #249-251 arc, which was Stern’s last work on the title): that Roderick had a brother Daniel who looked enough like him (but wasn’t a twin) that he would often pose as Roderick (after adding a hair piece), giving the villain the opportunity to don the Hobgoblin identity. Stern’s reveal would explain how a Kingsley was able to scream out during the Hobgoblin attack in ASM #249 and would also considerably clarify the “where’s my brother” scene involving “Roderick” in ASM #250. Unless I’m reading this mini-series incorrectly, I’ve been led to believe that pretty much every “Roderick” appearance in the Spider-Man universe is Daniel, including the time Kingsley was shot in Web of Spider-Man #30 (as discussed earlier this week). So finally Stern gets to tell his story. But now what? There are major storylines from comic’s past along with some significant plot-holes that need to be addressed by Stern’s thesis. And some were dealt with more tactfully than others. 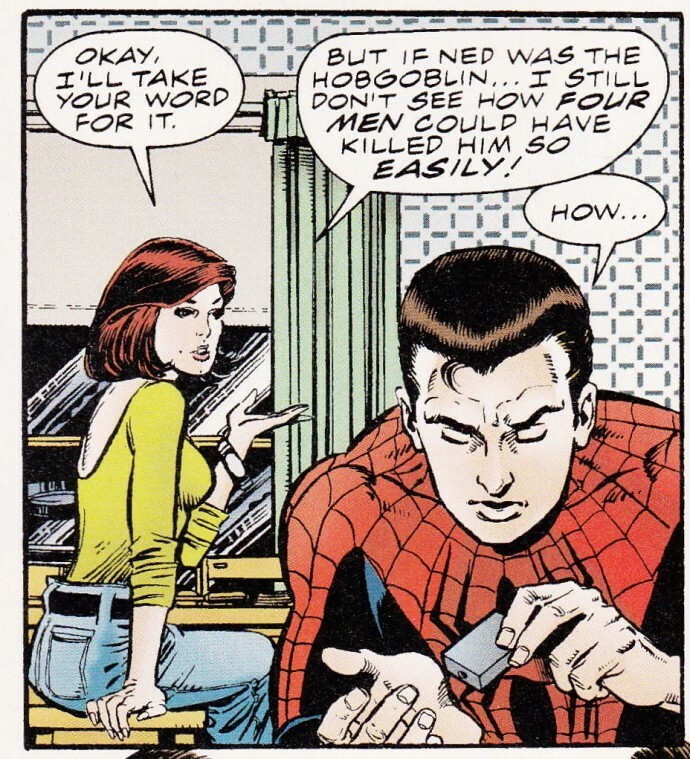 Perhaps the toughest pill to swallow is the fact that in light of Ned being outed by Macendale earlier in the story it’s Mary Jane of all people who’s able to put two-and-two together and question how Ned could have possibly been killed as easily as he was in the Spider-Man vs. Wolverine one-shot if he had the physical powers of the Hobgoblin. MJ’s rhetorical question is a “eureka” moment for Peter, which puts him on the case. The unfortunate thing is, readers had been bringing this point up about Ned for years. It seems awfully convenient for Peter to “get it” now once MJ thinks out loud. From a sheer comic book reading experience perspective, the fight between Spider-Man and the “real” Hobgoblin is great as Spidey FINALLY gets to have his crowning moment against this villain. I mentioned in my write-up of ASM #251 last week that throughout the “Original Hobgoblin Saga,” Spider-Man never gets his true “superhero” moment until that issue, and even when he finally does, there are some not-so-subtle hints that the Hobgoblin would live to torment Spidey another day. In “Hobgoblin Lives,” the Hobgoblin – the Roderick Kingsley Hobgoblin – is taken away in superpowered chains. The saga is finally over (until he escapes again, of course). I really enjoyed Frenz’s work on the big reveal. He juxtaposes MJ ripping the wig off of Daniel and Spider-Man pulling the mask from Roderick. I still don’t totally buy that Roderick and Daniel could look THAT much alike and not be twins, but maybe that’s just me. Either way, it’s a fun comic book visual to see those two panels next to each other like that. So while the Hobgoblin Lives answers some questions, I also wonder if it raises a whole bunch of new ones. That’s why tomorrow I’m going to look at the origins of Roderick Kingsley and see if he was ultimately a worthy choice to be the Hobgoblin. With all due respect to Roger Stern, who is probably responsible for many of the greatest non-Stan Lee stories in Amazing Spider-Man history, I just wonder if fans would have been equally disappointed in 1987 if they had gotten this story for the Hobgoblin reveal, instead of Peter David’s ASM #289. Depending on how early you believe Stern had planned this, Kinglsey was portrayed a little inconsistently from his first appearance in Spectacular Spider-Man, sometimes as a weak and weedy figure, sometimes as a more ruthless type. I think someone once sat down and worked out which Kingsley had been seen in every appearance. Back in 1996/7 this was a fun series to read and a real change after all the Clone Saga stuff but Kingsley was an obscure and forgotten character which lessened the impact. And Peter David was annoyed about criticisms of the easy defeat – he argued it was natural to assume the Foreigner’s men were highly trained and strong enough to take out a journalist even with super strength.